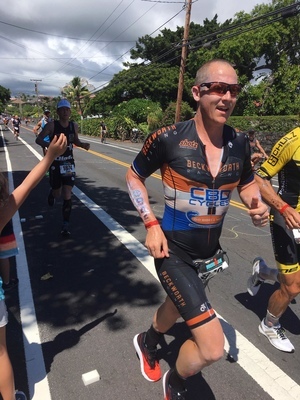 GO DAD: Zara and Oliver Taylor high-five their father Nathan during the Ironman World Championship in Kona, Hawaii. 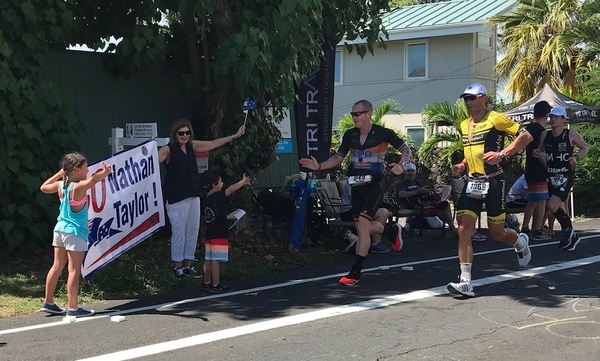 Torquay’s Nathan Taylor has conquered his Ironman World Championship ambition, smashing his previous personal best on the Hawaii course by 38 minutes. “Woohoo!” an ecstatic Taylor said from Kona on Monday. Taylor’s wife Rima and children Zara and Oliver watched as he crossed the finish line of the gruelling 225km triathlon on Saturday. “Rima had tears as I ran down the final 700m,” he said. Taylor completed the course in 9:28:44, placing 25th in the 45 to 49 age group and 332nd out of 1,668 men overall. He was also the second-fastest Australian in his age group. 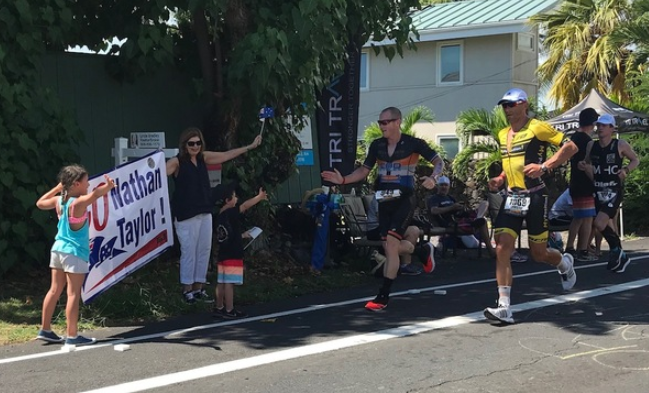 The run was Taylor’s second-fastest ever and his PB at the Kona course, which is known for scorching temperatures, high humidity and strong winds. 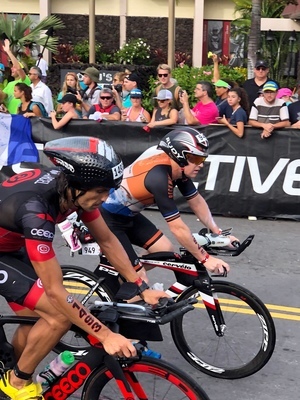 “It was great conditions for Hawaii, winds weren’t as strong as the past, but it was possibly hotter (than normal) in the run – it was cooking,” he said. “The heat was punishing, it was so hard to cool down. “I think my PB came from showing patience and using my past experience to not overdo it. “It was just survival on the run. I tried to hold a pace that I could maintain. Taylor set up the PB with a career-best ride of 4:47:43, beating his previous mark by 14 minutes and his best cycle at Kona by 24 minutes. But the run was where the mind games began. “Last year, I had really bad mind games and struggled a fair bit,” he said. “This year I was aware of it and tried to turn a positive into a negative. “For example, when running up the hill out at 30km, all your mind is saying is, ‘stop and walk’. “So I was telling myself, ‘you’ve only got another 400m and you will be at the top of hill’ and ‘you’re almost home’. Taylor’s supporters also helped get him over the line, he said. On Saturday night he celebrated with a well-deserved pizza and a few beers with coach Adam Beckworth and Leopold runner Josh McMahon. McMahon ran the course in 9:45:52 in his first Ironman World Championship at Kona. “He had a great race,” Taylor said.